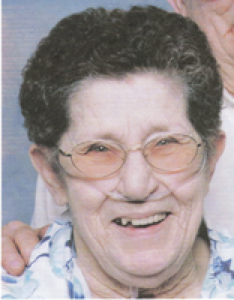 Dorothy Jean Doty, 73, 704 W. Williams, Bellefontaine, Ohio died at Sidney Care Center, Sidney, Ohio on Sunday, January 21, 2007 at 1:10 PM. She was born December 10, 1933 in Bellefontaine, Ohio the daughter of Ed and Edna (Durflinger) Brown and they are deceased. She was married on November 7, 1952 to Robert E. Doty and he survives along with three children, Cathy Herford of Piercton, Indiana; Robert Michael of Bellefontaine, Ohio and Janice Kelly of Sidney, Ohio; nine grandchildren and 15 great-grandchildren and one brother, Frank Brown of Bellefontaine, Ohio. She was a 1952 graduate of Lewistown High School, Lewistown, Ohio. Graveside services will be held in the spring at Fairview Cemetery, West Liberty, Ohio with Alana Vrooman, the granddaughter and an ordained minister. Funeral arrangements are being handled by Salm-McGill and Tangeman Funeral Home, Sidney, Ohio.